Last week, four-and-a-half-years on, we met again. Several days earlier Robinson had announced he was leaving the movement he had formed, saying — to some guffawing — that he was no longer able to control the genuine far-right elements who sought to hijack his movement. He was aided by the Quilliam Foundation, an anti-extremism think tank, and it was a close Muslim friend of mine who had been guiding Robinson through some of this who called me up to ask if I would hear Robinson out. I agreed. And there certainly are issues. Robinson was in Luton town centre in 2009 when the Royal Anglian Regiment’s homecoming parade was barracked by the radicals of Al-Muhajiroun. In a disastrous policing decision Al-Muhajiroun were protected by the police and angry locals threatened with arrest. Any politicians or opinion formers who think there is not a problem in places like Luton have never been there. He now acknowledges, however, that the EDL’s professed message — opposition to Islamic extremism — was lost almost from the outset. Some of this, including some disastrous generalising about Muslims, Robinson now admits to be his fault. Other problems, including the opposition which formed against them, were not. Supporters of Unite Against Fascism often got involved in serious violence when they turned up to ‘oppose’ the EDL. But UAF receive significant political support, whereas from the beginning the EDL were pariahs whom no one in power could dream of supporting. Robinson and his friends see some of this as a class issue and perhaps they are right in part. Certainly there is a disenfranchisement issue. Robinson says he does not know anyone who votes, and Luton borough council, which talks to Islamic extremists, said it would ‘never’ sit down to hear -Robinson out. He does have a litany of charges against him. Robinson is currently awaiting trial after a tax investigation carried out by the police and says all his immediate family have had their finances examined by the police in recent years. He says his own bank account and all assets have been frozen for four years and his businesses run into the ground. He is apparently allowed access to only a small sum of cash each week. There is a video of Robinson being arrested while attempting to walk through Tower Hamlets and he tells me that he was arrested for incitement after (by his account) one EDL demonstration went three minutes over its allotted 30-minute running time. Then there are the ‘constant, constant death threats’. When somebody posted his mother’s address online and promised to ‘chop up’ Robinson’s kids he finally went to the police. He says they told him they could do nothing about it. He began retweeting Twitter threats, but says he was told by police that if he continued doing so he could face arrest himself. Robinson tells me that he has spent four and a half years being called a racist while fighting to keep actual racists out of his movement. But now he has given up that struggle. There will be those who will rejoice at that. Most of us will breathe a sigh of relief if the EDL’s brawling protests now cease. But even if it does go away, our authorities would be very unwise to keep ignoring the issues that gave rise to this reactive -movement. 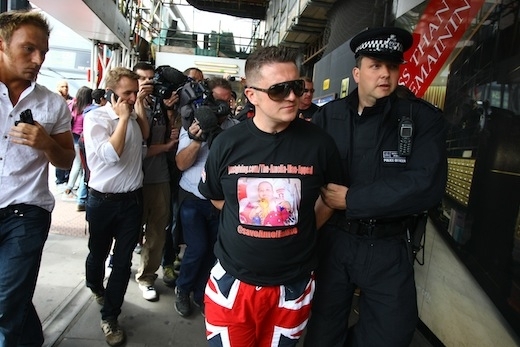 As we say goodbye, I cannot help reflecting that our society would never have heard of Tommy Robinson if it had dealt with Islamic extremists with anything like the severity it has meted out to him.